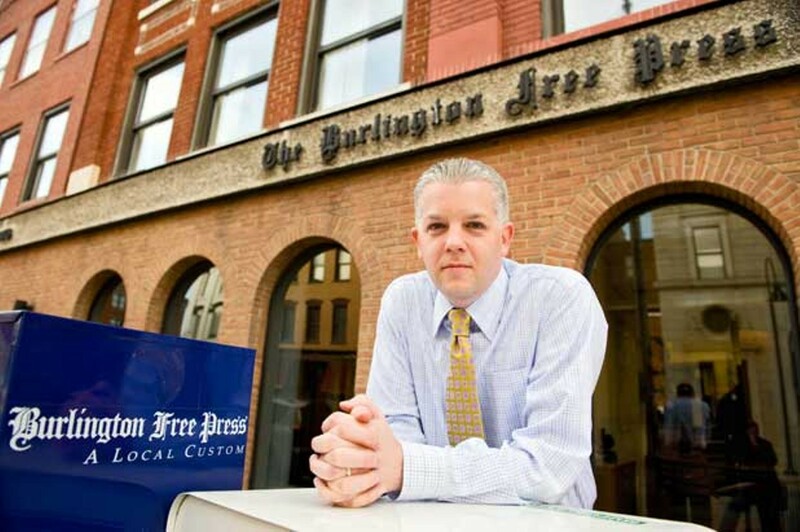 Can Brad Robertson save Vermont's largest daily? The Burlington Free Press is in the news business, but it’s not giving readers an in-depth analysis of its own story. Vermont’s largest daily, which is owned by Virginia-based Gannett Corp., has made some big changes — partly in response to the weak economy, partly in response to the habits of a diminishing pool of readers. Over the past year, the paper has thinned. Classified ads no longer appear daily. Last week, the Free Press announced that it’s collapsing the paper into two sections on Monday, Tuesday and Wednesday. The Freeps has also changed the way it presents local, national and international news. There’s a new news summary on the lefthand side of the front page, and an expanded section of “briefs” on page 2. A statement by Executive Editor Michael Townsend in last Monday’s paper proudly announced that the new format means more stories. But the “stories,” taken from “wire reports,” are no more than two paragraphs long. Some pages are entirely byline-free. That’s because there are fewer writers in the newsroom on College Street. In the past year, the Free Press has laid off 15 people, including columnist Ed Shamy (see related story). It’s also eliminated seven jobs, bringing its total workforce to 226. Yet, even as the Free Press’ flagship publication, and its staff, shrinks, its array of niche print and Internet-based publications is growing and changing all the time. Weekend, a pull-out section in the Thursday edition, is no longer distributed free in yellow boxes around Burlington; Bscene has taken its place as the paper’s stand-alone free paper targeting young people. GreenMountainMoms, which was once a website and print magazine, was relaunched last fall as the web-only MomsLikeMe. The Free Press also publishes The Green Mountain Fun Guide, Real Estate Extra and the longstanding regional shopper Buyer’s Digest. Hometown replaced the suburban editions covering Essex, South Burlington, Colchester and Franklin County that were mailed free to area households for about a year. All of these products are designed to reach more targeted segments of the media audience. But, unlike The Burlington Free Press, they largely lack critical reportage. Why should Vermonters care about economically driven changes to the state’s largest daily? And, perhaps more puzzling to our readers, why did Seven Days devote this week’s cover spread to a story about its largest competitor, a paper we routinely ridicule in these pages and refer to, both affectionately and derisively, as the “Freeps”? Simply put, because, love ’em or hate ’em, a daily newspaper is essential to a functional democracy. And, whether we like to admit it or not, our own publication, like our city and state, benefits from a thriving — and yes, competitive — free press. Media maven Craig Chevrier, who teaches a class at Champlain College called “Social Responsibility in Media,” offered a more colorful critique during a panel discussion with Free Press reporter Candy Page and Seven Days staff writer Ken Picard that was broadcast on Channel 17 last April. “I think the Free Press is the journalistic equivalent of Froot Loops,” he quipped, comparing the 182-year-old daily to a processed food product. Not surprisingly, Free Press publisher Brad Robertson has a different view. He bristles at a reporter’s suggestion that the Free Press is in any way diminishing its product. “As much as you might look at it and think, ‘Oh, my God, the thing’s falling apart,’ I look at it and say, ‘Actually there’s more local news in these newspapers now than there used to be,” he says. In fact, Robertson himself is one of the recent changes Gannett has made to the Free Press; the company brought the 36-year-old exec to Burlington in November 2007, to replace longtime publisher Jim Carey. Obviously, you can’t attribute all the changes at the paper to the local publisher; he does work for a large corporation and surely has his marching orders. But it’s hard to deny that Robertson is breathing new life into this local institution and reshaping it in vital ways. Robertson is definitely making his mark. But will his efforts save The Burlington Free Press or accelerate its demise? Robertson is exactly what the Free Press needs, according to his friend Ted Adler, founder of the Burlington web design firm Union Street Media. Though Adler and others often describe Robertson as “an innovator,” he’s also firmly grounded in the newspaper biz. His dad worked for the Gannett-owned Rockford Star Register in Illinois; Robertson started delivering papers when he was 7 years old. He graduated from Northern Illinois University in 1994 with a B.A. in Communications, and he’s spent almost his entire professional career working for Gannett, though always on the business side. Robertson is the consummate company man. He’s had tours of duty at several Gannett-owned papers, including The Journal News in New York, the Fort Collins Coloradoan, the Springfield News-Leader in Missouri and the Detroit News Agency, which runs the Detroit Free Press and The Detroit News. Most recently he was the vice president of business development and vice president of advertising at the Des Moines Register in Iowa. In 2006, the Newspaper Association of America included him in its “Top 20 Under 40” list that highlights rising talent in the industry. In April 2008, he received a Gannett’s President Ring for the second year in a row. That’s a company award that recognizes 10 outstanding employees for their leadership, innovation and impact on the community. Despite his prematurely gray hair, Robertson exudes a boyish charm. He’s a natural salesman. It’s hard to not like him. The tall, trim, charismatic exec is about as different from his predecessor as it’s possible to be. Jim Carey made people come to him, and he rarely returned calls from reporters. By contrast, Robertson seems to be everywhere, possibly to make up for the fact that he’s relatively new in town. He’s on the board of directors of the Greater Burlington Industrial Corporation, the Burlington Business Association and the Vermont Center for Emerging Technologies. He’s a member of the Vermont Business Roundtable and an advisor to the Champlain College Creative Media and Communication group. Earlier this month, he co-moderated the Burlington Business Association’s mayoral debate, with Free Press Executive Editor Mike Townsend. He also returns calls from reporters, though he warns that, pending the outcome of this story, he may stop returning ours. Maybe not, but his affinity for new-media tools — he actively uses Facebook, LinkedIn and microblogging service Twitter — is noteworthy. When he learned he was coming to the Free Press, for example, he logged onto his LinkedIn account, searched Burlington, and looked for people with the most connections. He introduced himself via email and asked to meet. That’s how he met Adler. Say what you will about newspapers being behind the times, the publisher of the Free Press is definitely wired, and he’s brought that sensibility to the paper, leading by example. The professor recalls a more recent online interaction with Robertson from December. Mindich posted a message to his Twitter feed noting that he sold his car in a flash on Craigslist, and got no leads from a Free Press classified ad. Robertson wrote back to him to ask how the Free Press could keep his business. Mindich was impressed. “I thought it was a very proactive and hands-on approach,” he says. The newspaper industry would benefit from some new approaches. Many prominent publications across the country are faltering. The Tribune Company, which owns the Chicago Tribune and the L.A. Times, is in bankruptcy proceedings. So is the Star Tribune — aka the Strib — in Minnesota. There’s even speculation about The New York Times, which is scrambling to come up with the money to make a $400 million debt payment in May. The RIP column on Paul Gillin’s Newspaper Death Watch blog lists several papers that have already gone under. In the current tough economic climate, more are probably coming. It’s worth noting that not all newspapers are facing the same challenges. For example, Emerson Lynn, editor and publisher of the St. Albans Messenger, a Monday-through-Saturday daily serving Franklin County, reports that his business was up last year over 2007. Or, at least losing less money — newspaper trade associations the Suburban Newspapers of America and the National Newspaper Association released a report last week showing that community newspapers suffered a 1.7 percent decline in the third quarter of 2008, as opposed to an overall decline in the newspaper industry of 18 percent. Lynn’s brother Angelo owns the Addison Independent, which covers Addison County and is published twice weekly. Together, the two also own weeklies in Colchester and Milton. Lynn says their papers are all still profitable and none has laid anyone off. It’s fair to say that Gannett is struggling. The Virginia-based entity owns 85 daily newspapers across the country. In October, Gannett reported third-quarter revenues of $1.64 billion, compared with $1.8 billion for the same quarter in 2007. Its fourth-quarter numbers will be released on Friday. How profitable is the Free Press? It’s hard to say for sure, since the paper’s financial information is a closely guarded secret. But a memo leaked in November to Gannett Blog, a website run by former USA Today reporter Jim Hopkins, suggests that the Free Press actually does still have a healthy profit margin — or at least it did in 2007. According to Hopkins, in the first three quarters of 2007 the paper had ad revenue of $21.3 million and a profit margin of more than 36 percent. That translates into roughly $7.7 million in profit through the third quarter, and excludes the holiday ad spending frenzy reserved for the fourth quarter. All of this may explain Gannett’s cost-cutting measures over the past six months: In August, the company axed 1000 newspaper workers, including six Free Press staffers. In September, during a purge of several hundred of Gannett’s midlevel and senior managers, two Free Press managers retired and had their duties taken over by counterparts in Wilmington, Delaware. The paper raised its single-copy price a quarter, to 75 cents, and, to reduce costs, moved its circulation call center to Kentucky and outsourced some of its design work to India. Toward the end of 2008, Gannett laid off close to 3000 people, roughly 10 percent of its newspaper division employees. The Free Press laid off a total of nine, four of them from the newsroom, and trimmed five additional vacant positions from the payroll, two of which were from the newsroom. Then, earlier this month, Gannett announced that, in order to stave off further layoffs, it was requiring all company employees to take a week-long, unpaid furlough before the end of March. Gannett has been more aggressive than most newspaper chains in responding to the shifting media landscape. The company has rigorously remade its newsrooms into 24/7 “Information Centers.” In fact, Robertson helped design that model. “Overall, there’s never been more of an imperative to be creative in how we look at what we do,” says Jennifer Carroll, a former executive editor at the Free Press and currently vice president of Gannett Digital. For example, in Wilmington, Delaware, Gannett restructured the newsroom staffing patterns to mimic the old afternoon dailies. That meant, rather than reporters and editors strolling in around 10 a.m. and then heading into news meetings to talk about the next day’s paper, the news desk kicks into gear around 6:30 a.m. with traffic reports, late-night sports scores and early reports on news that is just breaking. Those stories are updated throughout the day, new ones are generated, and the next day’s print content comes together. “This new approach also gives us some of the momentum to try more challenging projects,” says Carroll. That includes more database reporting, but also using new digital tools to let readers in on the story, posting the databases online and letting them dig around themselves. The Free Press has adopted aspects of this approach as well. Reporters are increasingly using newer narrative reporting tools such as audio slideshows, video, reporter blogs and live blogs. On the live blogs, reporters don’t just report the news; they guide discussions and encourage reader participation online. The Free Press now routinely live-blogs events as they happen, including the BBA’s recent mayoral debate. Its online coverage of Election Day in November included a live blog and several video streams from the local political-party gatherings. Creating a multitude of targeted niche products is another key part of Gannett’s survival strategy. Consider what’s happened in Cincinnati. “In recent years, Gannett’s Cincinnati arm has gone from producing one metropolitan newspaper to producing 270 niche publications, including suburban papers, neighborhood [websites], and regional magazines,” notes a July 2007 article on the company from Wired Magazine. Part of Cincinnati’s mix is a moms’ social-networking site, CincyMOMS, — now also renamed MomsLikeMe — aimed at busy, young mothers who no longer read the newspaper. It was one of the prototypes for the Freeps’ GreenMountainMoms. The Free Press’ photo-heavy Bscene is much like other free entertainment-and-nightlife weeklies Gannett produces. It’s full of ads, event listings, a couple of short features, and lots and lots of photos. Because, haven’t you heard? Young people don’t read. Robertson talks about the company’s new diversity of products like a true bean counter. “Some of these are ‘reach vehicles,’ some of these are ‘ad-result vehicles,’ some of these are, you know, just spending a customer’s money as wisely as possible, or reaching an audience in different ways,” he says. Robertson is particularly proud of Hometown, a free weekly that’s mailed to all households in Burlington and Winooski, and has recently expanded distribution to Shelburne and other suburbs. Hometown replaced the Freeps’ short-lived suburban editions, which contained stories about Burlington’s suburbs that had been repurposed from the main newspaper. Content, maybe, but news? Here are some of the headlines from last week’s issue of Hometown: “Quilting group stitches in Hinesburg.” “Fans celebrate retired Williston teacher.” “Moms exercise while babies socialize in South Burlington.” Don’t look for letters to the editor or coverage of city government. But actual news reporting costs money, and that’s in short supply. To survive, the Free Press will have to do more with less, which means relying more on press releases, wire reports and user-generated content rather than trained professional reporters. David Mindich is complimentary of the way the Free Press has embraced the web — “I think they’ve come a long way. They’ve improved,” he says. But looking at their website, the professor points out that they could do a better job separating the wheat from the chaff. That’s, after all, what newspapers are supposed to do — tell us what’s important. Though he agreed to answer our questions, Robertson says he doesn’t understand why anyone would care about the ins and outs of the business decisions at the Free Press. Like many Vermonters, we here at Seven Days read the Free Press daily. We’re as saddened as everyone else when the Freeps lays off one of our favorite writers. Here, then, is a partial list of our faves, along with a plea to Brad Robertson and his bosses at corporate — please keep ’em! Though we’re not sure whether that will help, or hurt, their chances . . .
Candace Page: She’s the state’s preeminent environmental reporter, and possibly the most highly regarded print journalist in Vermont. She live blogs, too. ’Nuff said. Lauren Ober: “Ober and Out” is the Seven Days-iest of the Freeps crew — meaning that she’s smart, funny and a lot edgier than the average Gannettoid. Matt Sutkoski: Don’t let him go — someone with some institutional memory has to cover the crazy crap going on in Winooski. Sally Pollak: In our opinion, the best features writer you’ve got. It really bums us out when she scoops us. Molly Walsh: We need someone to tell us when our teachers are making the grade. Sam Hemingway: Peter Freyne called him “Sam the Sham,” but, honestly, we love the guy. The Free Press wouldn’t be the same without him. Nancy Remsen & Terri Hallenbeck: The Free Press’ statehouse team keeps tabs on the state’s pols without an office in Montpelier nine months of the year. Seven Days is facing the same economic challenges as every other newspaper in Vermont. We have fewer ads than we did last January, particularly in the help-wanted department, which is not a huge surprise considering the rising rate of unemployment. We grew last year, but at a pace that started to slow in November. To be safe, we laid off one person, our news editor, who was the least senior member of our editorial staff. And though Seven Days is locally owned, designed and administered and largely written by Vermonters — with the exception of a handful of syndicated features — we do print the paper at the Plattsburgh Press Republican.